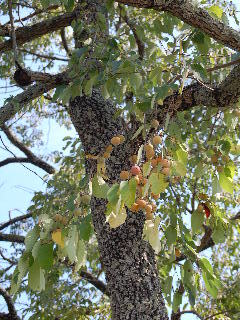 The common persimmon tree (Diospyros virginiana) is a member of the ebony family. Most of the species in the ebony family are native to tropical or subtropical areas of the planet, but the common persimmon tree is native to—and is widely distributed throughout—much of the eastern United States. The tree is found in sparsely wooded or open areas and especially along fertile river plain areas from the Gulf coastal area to the northeast and stretching into the Midwestern states beyond the Mississippi River. Persimmon trees will not tolerate excessive shading and are thus not usually found in densely wooded stands. If you have a common persimmon tree on your property or know of one growing close by, it is probably naturally occurring there rather than having been planted by the landowner. Occasionally, Japanese or Oriental persimmon trees can be bought from garden centers and planted into the homeowner’s landscape. These ornamental trees will assume a shorter (to about 25’ tall) denser growth habit than the common persimmon trees that can attain heights up to 50 or 60 feet, though at a rather slow rate of growth. The bark of the common persimmon tree is distinctively recognizable by its dark gray to almost black coloring and its small rectangular block structure. The wood of the persimmon tree is extremely dense and hard. This makes it commercially desirable for use in the production of billiard cues, drumsticks, and (before the introduction of strong lightweight metals into the manufacture of sports equipment) golf club heads (woods). Some of the tropical and Asian persimmon woods are of darker coloring and are used in the making of fine furniture and musical instruments. 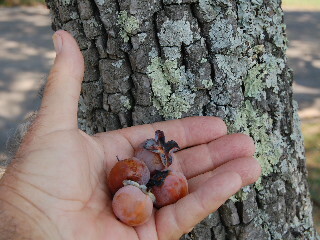 The fruit of the persimmon tree is a shiny-skinned purplish orange colored globe about the size of a ping-pong ball (1 to 1 ½ inches in diameter). As the fruit becomes riper, it turns a darker deeper rosy purple color and falls to the ground, where it is often consumed by wildlife. The fruit can also be eaten by humans. It contains some potassium, magnesium, and fiber, though not a significant amount of any of these. Persimmons can be eaten raw or cooked into puddings. Ripe persimmons have an orange colored flesh that is about the consistency and texture of a very ripe banana. If the persimmon is fully ripe, the pulp has a pleasantly sweet taste. Unripe persimmons are extremely bitter tasting to the point of being inedible. The true ripeness of the persimmon fruit does not occur until mid to late fall with the arrival of cooler days and nights. Contrary to folklore, it is not necessary for frost to occur in order for the fruit of the persimmon tree to develop its pleasantly sweet (and thus edible) flavor.